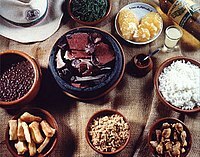 Açaí na tigela ("açaí in the bowl") is a Brazilian dish made of frozen and mashed açaí palm fruit. It is served as a smoothie in a bowl or glass, and is commonly topped with granola and banana, and then mixed with other fruits and guaraná syrup. Açaí na tigela is popular all over Brazil, but mainly in Pará, Rio de Janeiro, Florianópolis, São Paulo, Goiás and along the northeastern coast, where it is sold in kiosks lining the beach promenade and in juice bars throughout the cities. The preparation differs from region to region. Tapioca pearls is a common topping in the North, but not in the South. The original recipe, as eaten in the North, contains shrimp or dried fish and tapioca and is usually salty. The sweet variety, which contains granola, banana and other fruits, as well as sugar, is common in the southernmost parts of the country. ^ "Culinary Encyclopedia: Acai Berry". Retrieved 2012-11-24. This page was last edited on 17 April 2019, at 10:14 (UTC).